← A pinch of SALT? 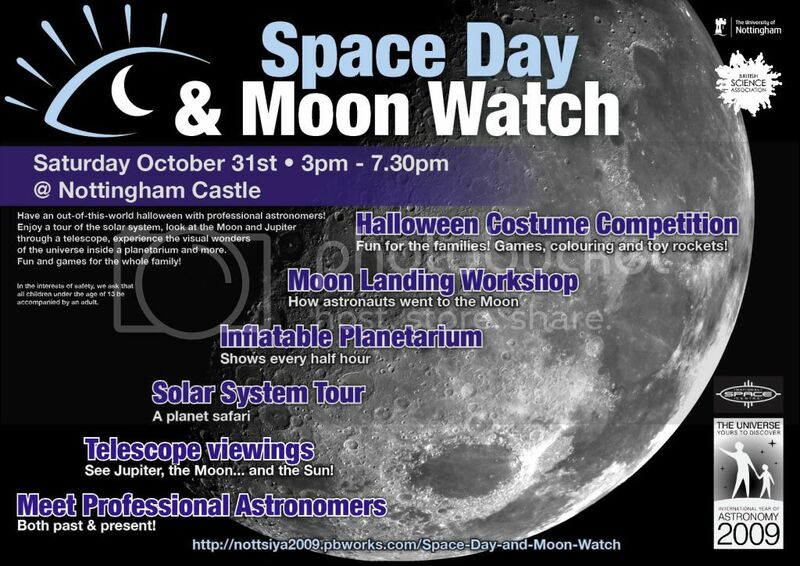 October 31st is the date set for our Space Day and Moon Watch event at Nottingham Castle, and it looks set to be a lot of fun. I’m rather glad I got to be involved! Highlights are going to include a few of us local astronomers being dressed up as famous scientists from history (such as Einstein and Galileo), telescope viewings for the general public and, of course, a set of talks. I seem to be rapidly becoming the resident oddball astrobiologist, so I’ll be speaking again at this one. Being a Moon Watch, I’m going to be concentrating on the Moons in the solar system. And curiously, I haven’t written nearly enough about Titan or Europa on this blog. Watch this space! In any case, if you happen to be in Nottingham for Halloween, please feel free to come along. If only to laugh at us dressed up in silly costumes! This entry was posted in Imported from Livejournal and tagged outreach. Bookmark the permalink.